The product came in a fairly large tub, which is a hefty 200ml size. It was so hefty, it resided quietly on the bedside table, hidden under a pile of other potions and lotions, unobtrusive and unnoticed. 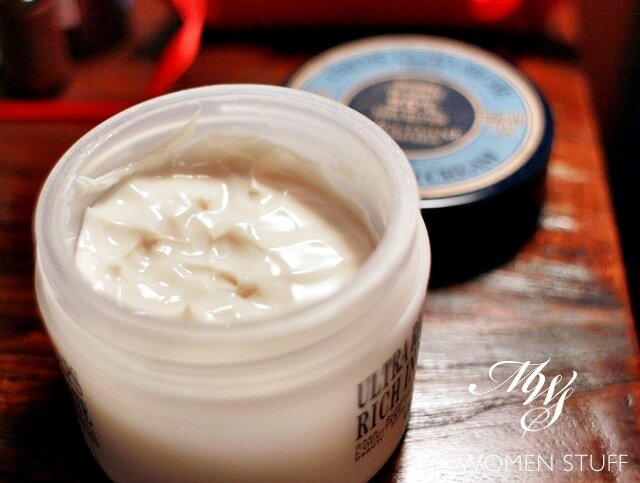 Opening up the Ultra Rich Body Cream yielded the scent of shea butter and baby powder. It wasn’t Lizard-gal’s favourite scent and left to her own devices, she would never have picked this up in store. But it said “Ultra Rich” and it said that it was an “ideal beauty balm for dry or dehydrated skin” and Lizard-gal had both. So, with this tub of salve at her side, Lizard-gal began a nightly routine of slathering this cream over her limbs, in a hope to reverse the evil spell and stop the slow morph into a scaly reptile. Despite her misgivings, she was gratified to notice that the cream, whilst labelled Ultra Rich, did not sit on the skin like cream frosting. Instead, it seemed to absorb into the skin and left a light feeling to the skin. On warm nights, she had to be careful not to mark her furniture with the residual grease on the skin. But in an air-conditioned environment, it felt more comfortable. Some days, when not even the Ultra Rich Cream felt enough, she would add a few drops of body oil to help the texture along. About a week later, Lizard-gal noticed that the itchy patch on her shin had stopped itching. The angry red spots were slowly disappearing, and the scars were starting to heal. The skin on her legs too felt lighter and more comfortable. It wasn’t until 3 weeks later that she noticed that she had slowly reversed the evil spell, and her legs (and arms) were slowly human again. The skin was smoother to the touch, without the rough bumpy flaky skin that preceded it, and it was starting to lose its scaly, shiny appearance. 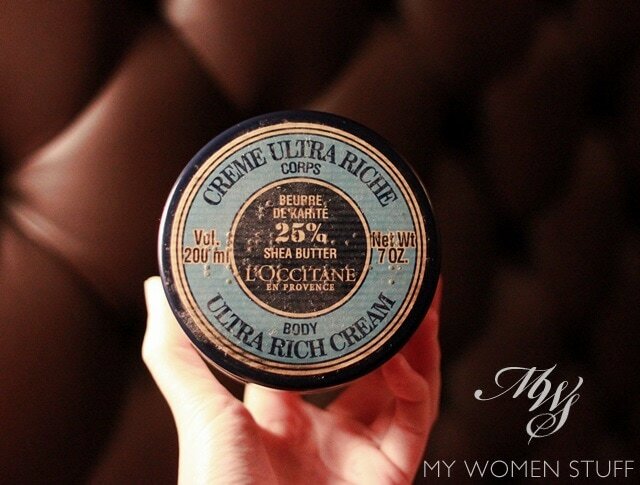 Was it attributable to the 25% shea butter that this Ultra Rich Body Cream contains? Or was it just the effort of combating the evil spell of laziness? Lizard-now-human-gal couldn’t quite say, but she vowed to never allow the evil spell to capture her again. She’s still applying this body cream religiously every night before bed in an effort to maintain her soft, smooth human skin and to hold the evil lizard-skin morphing spell at bay. The spell still clutches on to her toes where the skin feels and looks dry a lot of the time, but she’s working on eradicating the nasty spell. The smell does still take a lot of getting used to, but when a balm works as well as this one, to stop the evil lizard-morphing spell, it can be tolerated. 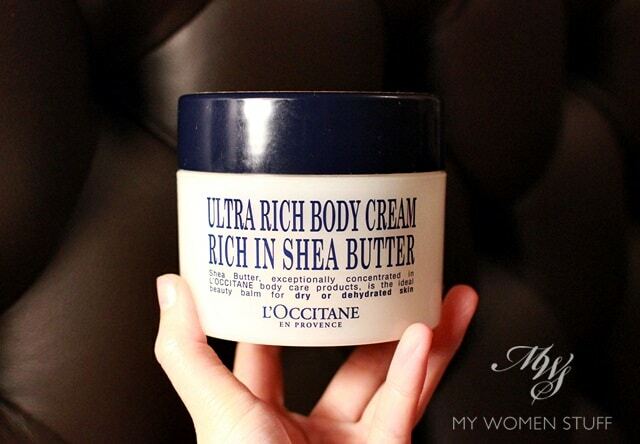 The L’Occitane Ultra Rich Body Cream with 25% Shea Butter is fairly thick cream with the consistency of double cream, that isn’t greasy or oily on the skin. It absorbs well and an amazing job transforming my very dry, scaly skin on my body to smooth, moisturised skin. I had been labouring under a lot of neglect so I still have a way to go, but this body cream has changed everything. When I want even more moisture and comfort, I add some body oil into the cream, but be careful because some scents don’t go well with the powdery scent of this product. CONS: Pricey, Strong powdery scent, Not portable because I’d love to travel with this! Have you used this body cream? Do you use a body cream regularly? Very interesting story =p. Anyway your story is very similar to mine, I’m extremely lazy with body lotions too. You should try giving nivea body conditioner a shot, as you use it in the shower and wash it off (similar to hair conditoner). I find I’m more incline to use it in the shower as compared to normal body lotions. Best of all its easy on the wallet! LOL I love this tale of Lizard-Gal hahaha! I believe you! 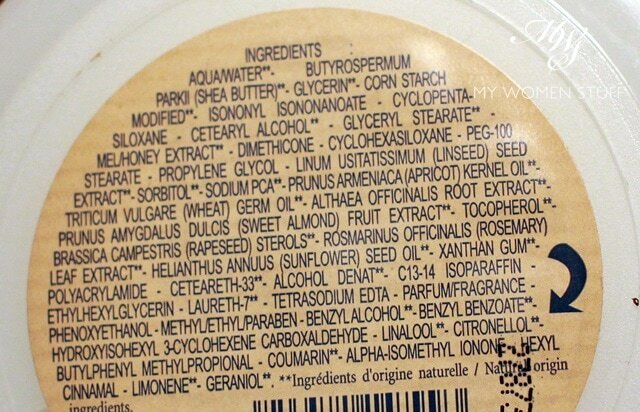 I just tried the Almond Shower Oil and LOVE it. And like you I HATE most body butters-I’m hot and flash remember so anything like that is just too much for me. But I think I can handle this for sure! Because I’m starting to turn into a lizard too lol! Tale of a Beauty Lizard Gal.. cheers me up Miss P.. well done! Dear me! 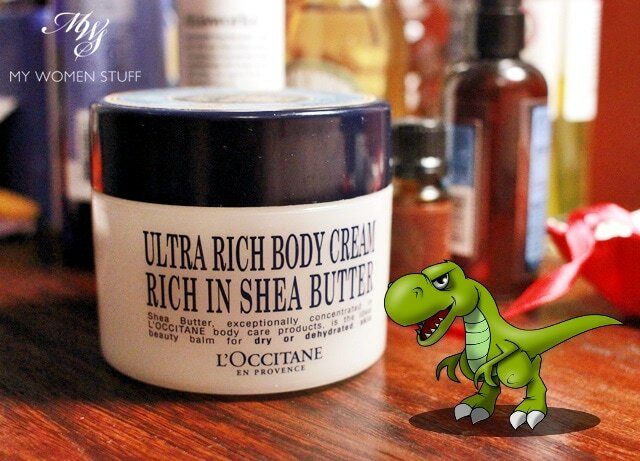 I wouldn’t want to turn into Lizard-gal just because I don’t apply lotions and creams diligently. *cries* I think I’ll morph starting from my feet. I still haven’t found a more affordable one that replaces the Clarins foot cream (which worked great but ran out too quickly for the price!). Any recs? Glad to know the scales sloughed off, LG – er, I mean, PB! I’ve apply argan oil, body lotion for dry skin and even hydrating cream for face but still no improvement. Still need to work hard finding the right one for my feet. Lily’s love on Clarins foot cream sounds promising as I love their Hand and Nail treatment. Oh my, I could be your Lizard Sister! I too have scaly skin…on my legs! I have tried so many lotions and potions and even “mixed” my own concoction of creams and oils for the so called ‘perfect’ cream that works! Maybe I should give THIS a try! But oh boy do I hate the smell of shea butter….someone should try making gula melaka scented body butter! That would convince me in a hurry! hahahaa… very nice bedtime story indeed.. me need some good cream too. I’m now just simply trying to finish up all the previous lotions/creams etc I bought. And I have plenty gifted (ain’t complaining). Just remembering to apply them does help in the long run. Let’s keep up the good work! I apply body lotion and foot lotion every day to prevent lizard skin! Otherwise I’d look like a reptile. That’s so diligent of you Mrs Tubbs! I’m trying hard to stick to a routine myself! But in your weather, I can imagine the lizard transformation happening a lot more quickly. I used to have lizard legs when I was in the UK previously – horrors! I’m such a pemalas on lotion/body cream routine. Me = lizard gal..